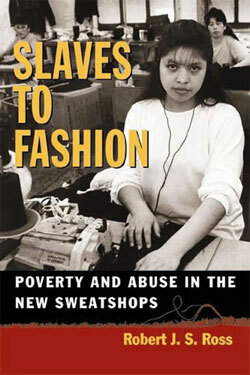 Just as Barbara Ehrenreich’s Nickel and Dimed uncovered the plight of the working poor in America, Robert J. S. Ross’s Slaves to Fashion exposes the dark side of the apparel industry and its exploited workers at home and abroad. It’s both a lesson in American business history and a warning about one of the most important issues facing the global capital economy-the reappearance of the sweatshop. Refreshingly jargon-free but documented in depth, Slaves to Fashion is the only work to estimate the size of the sweatshop problem and to systematically show its impact on apparel workers’ wages. It is also unique in its analysis of the budgets and personnel used in enforcing the Fair Labor Standards Act.